Posted on February 18, 2015 by I Never sign out at work. 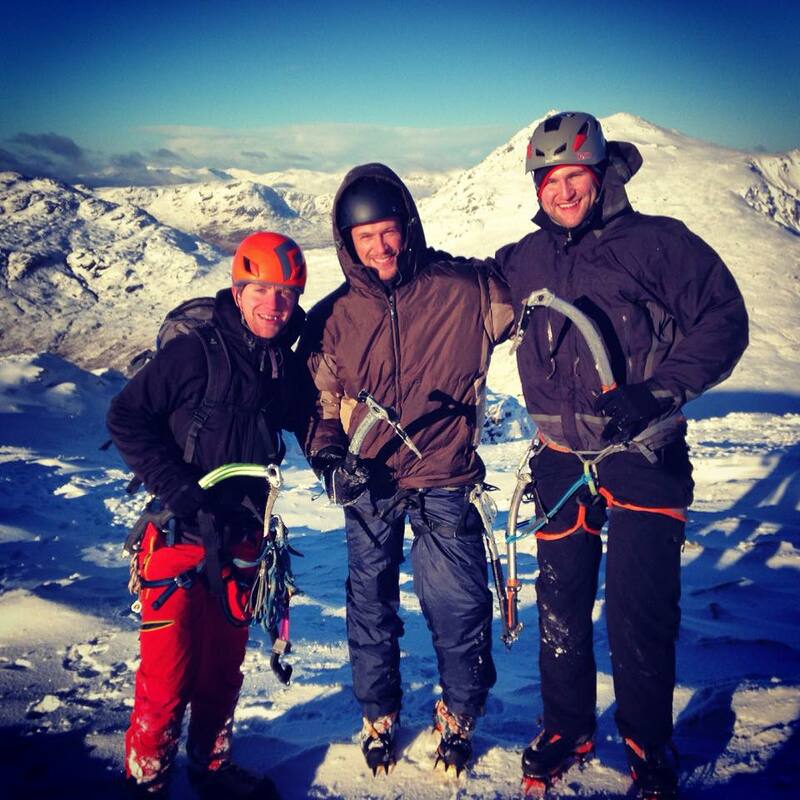 I took Stevie up Beinn An Dothaidh for his first winter climbing day out on Monday. 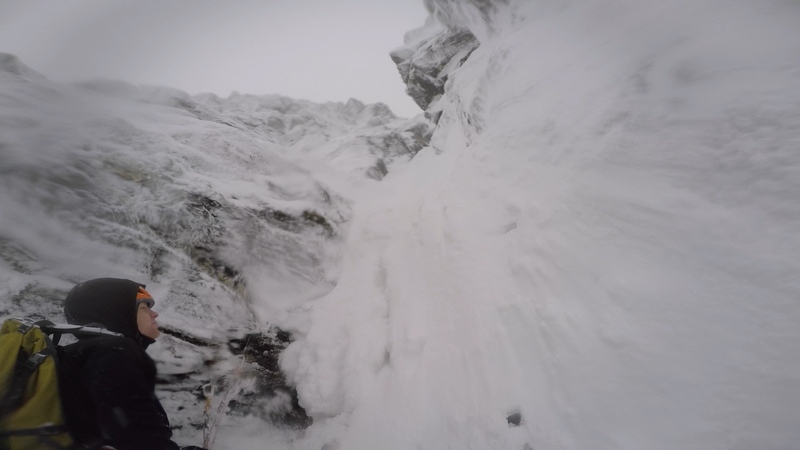 Having had plenty of trad experience and being a strong climber already we headed for Taxus ice fall variation (iv,4), something hard enough to get a good feel for the climbing but not so hard to scare him away from returning again! We started the walk-in moaning that it didn’t feel very cold and with the crag being hidden from sight from the car park we had no idea if the recent thaw would have stripped the route of the needed ice and frozen turf and if we were walking in to be disappointed. Five minutes into the walk the rain started, quickly turning to hailstones as we gained altitude and by the time we’d reached the base of the route we were soaked through from being consistently battered by the falling heavy snow. Last weeks sunshine and blue skies now just a distant memory. After kitting up, putting on some much-needed layers and suffering through the dreaded hot aches we started kicking steps up the approach slopes, finding harder more compacted snow than we thought would be about. 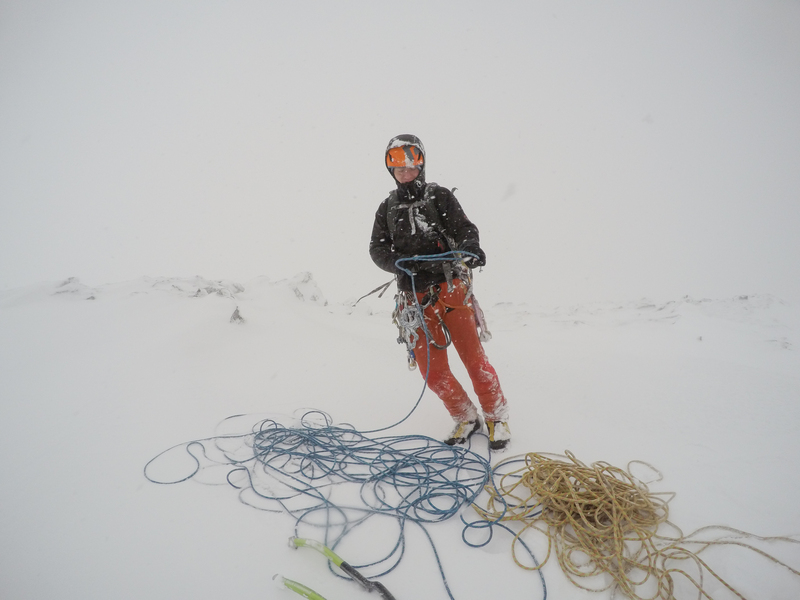 Getting the ropes out and tying in at the first belay we realised the temperature drop after having climbed through the freezing fog, noticing all the rime on all the surrounding cliffs beginning to grow. It’s amazing the difference one or two degrees can make, the difference between a days climbing and day of returning empty-handed. I started up the first pitch and started to get to grips with ‘swimming’ rather than climbing through the deep powder snow on the route. As I climbed up through the narrow gully between the two rock buttresses I was right in the firing line for the prevailing spindrift avalanches (powder snow blown over the cliff edge that flows like water over the more compacted snow, creating rivers of snow down the route) that would submerge me in their ten second torrents, covering me head to toe, filling my hood and jacket full of snow only stopping for enough time to make a few feet of progress before once again being hit by another cascade. 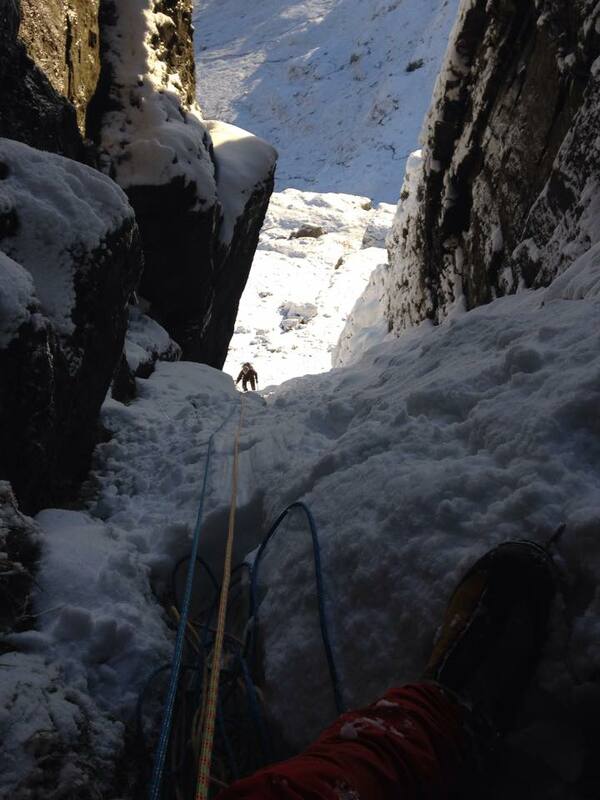 Only a Scottish winter climber will know the misery of such an experience. 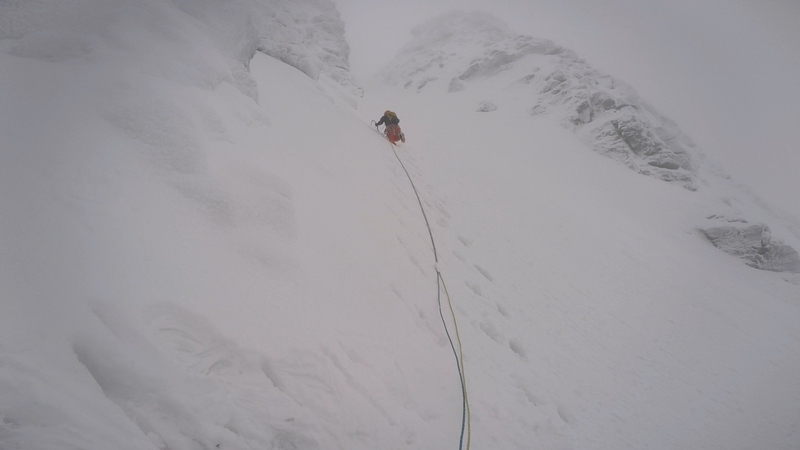 We got another purely Scottish winter climbing experience further up the route when I had run out of rope before finding an appropriate position to belay from, forcing me to dig away to find protection to secure myself to the wall. Resorting to two wobbly stoppers crammed into a flaring crack, backed up by clipping myself directly into my axes that were buried into the snow above me. Not ideal. I convinced myself it was adequate and after shouting down to Stevie, explaining falling off probably wasn’t a good idea he started up his first winter pitch, only truly understanding what I’d meant about the debatable security of the belay after seeing it first hand. After a few pitches of more enjoyable ice climbing and a decent belay, I headed up the last pitch towards the monster cornice (The accumulation of snow where the top of a route meets the ridge that can overhang, creating a false cliff edge purely made of snow) and prepared for the inevitable struggle to break out of the gully and onto the top of the mountain. 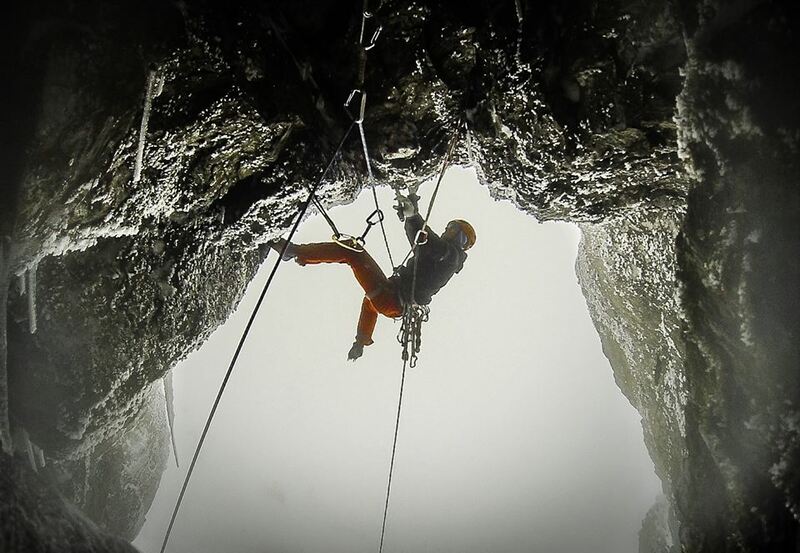 With nothing but a tied off ice-screw 20m below me I had no option but to start cutting my way through. By repeatedly filling cut steps with more snow I was able to raise myself a little higher every time and I finally mantled onto the ridge with the grace of a beached whale, the mountain congratulating my success not with a spectacular view but with a barrage of 70mph gusts and a white out, Typical! All in all the day was truly miserable but brilliant at the same time. 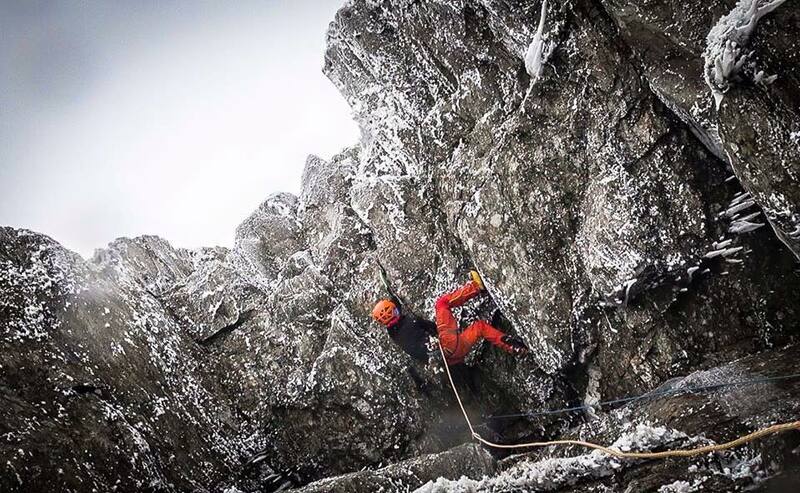 We’d had every season in one day but still pushed through to get a route done in what can only be classed as classic Scottish winter conditions. 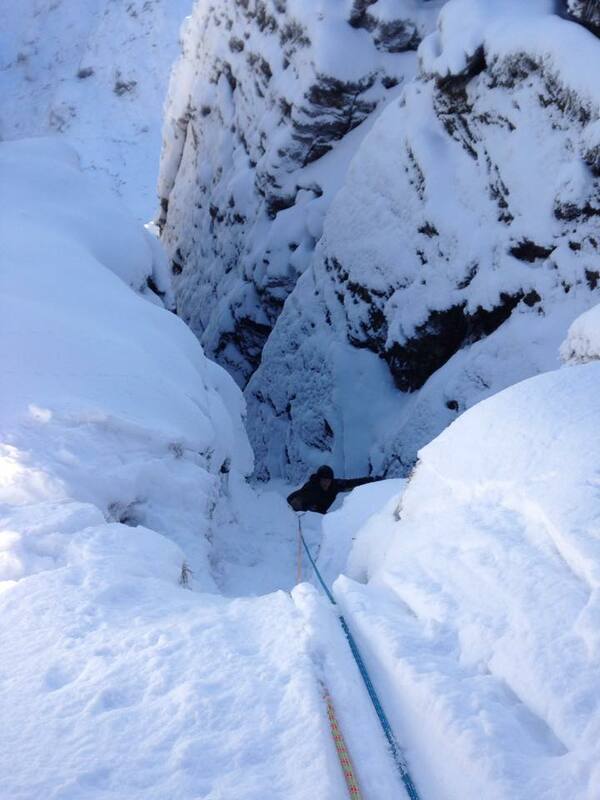 Stevie had got a harsh induction into winter climbing but we’d managed to complete his first route. Although leaving battered and cold we returned to the car with a smile on our faces knowing we’d prevailed when many others would have turned back, the sign of a good day. Posted on January 23, 2015 by I Never sign out at work. Last night me and Euan were checking out some photos that Kev Shields had put online from his and Dave MacLeod’s day out on the Cobbler. As we flicked through them we tried not to get jealous of them being out in the mountains when we were restricted to Glasgow for the next few days due to work and Euan being called for jury duty. Noticing that the crags were looking really well hoared-up in his pictures we jumped straight to it and messaged Kev to see if he’d happened to get a look at the condition of ‘The Cathedral’. 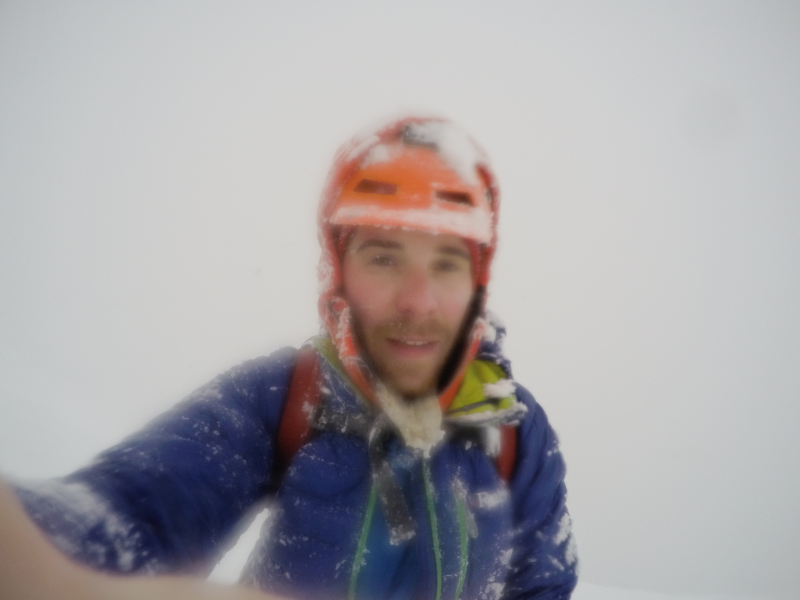 With it being a line I’ve wanted to try for a while and a real test-piece of Scottish winter climbing, I was always keeping an eye out for the right conditions to appear. To our amazement we were told it was in condition, with the whole crag being covered in rime, perfect for mixed climbing. The perfect conditions being so rare we instantly raced to social media to bribe people to cover our shifts and find out if the court was going to cancel last-minute, like it had the previous day. With our planners swept clean with the haste of an emergency we woke at 6a.m today, rushing out the door within the hour after stuffing our packs with gear and scoffing down a bowl of porridge. The walk-in was dismissed with little trouble with the path having been smoothed out with snow and well compacted the whole way. We chose to take the tourist path round the back and drop into the basin from the rear rather than our usual route that cuts up the front of the crag to avoid the knee-high powder that had accumulated there over the last few days. The crag was in the best nick I’d ever seen it with almost every route hoared-up and with good ice and bomber turf everywhere. We made our way across to the centre peak and started scrambling up the initial snow ramp to the belay stance, every step taking us further under the colossal and intimidating roof shadowing over us, serving as the visual representation of the nerves and fear that also shadowed over me. 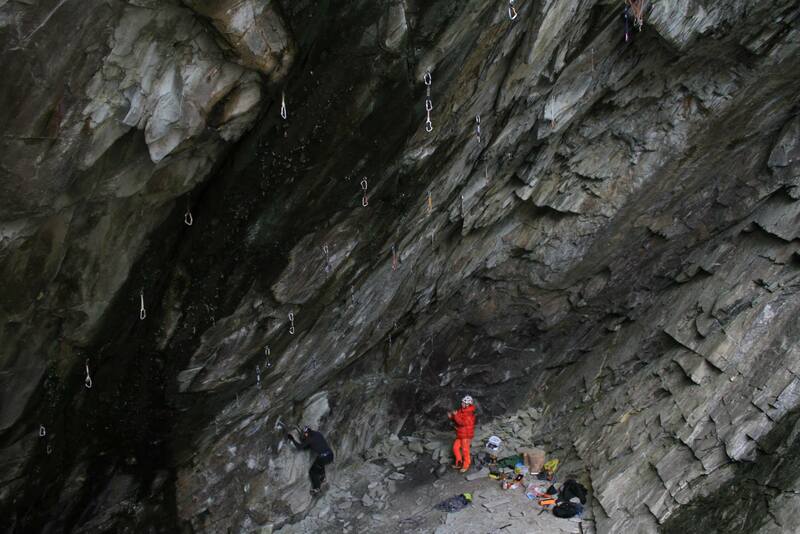 As Euan flaked out the ropes and set up his anchors to belay from, I went through my usual racking up procedure. Working the gear piece by piece onto my harness to their pre-specified places. This familiar and well-practised routine, identical in structure, brought some familiarity to the situation and help calmed my nerves, allowing me to focus on the task ahead. ‘The Cathedral’ is the route that takes the large overhanging arch (hence its name) that lies on the centre peak of The Cobbler. It follows the steep and technical right hand corner of the archway until you begin to traverse left into the centre on the underside of the roof. The fun begins as you climb horizontally out from the wall in front of you and out onto the 5 metre wide roof, feet level with your axes until you burst out over the lip of the arch and into easier ground to the top. From where we had set up I could follow the entire route with my eyes, no guidebook needed, no picture required, it all stood there, right in front of me. 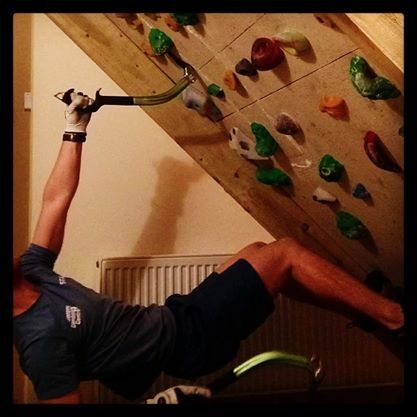 With a few words of motivation from Euan, all that was left to do now was start climbing. I started up the corner through some steep névé and turf getting my axes high in the crack and moving up to a thin layer of ice sat upon a slopping ledge whilst bridging out and smearing my crampons for purchase on any of the tiny fractures in the wall. With the crack narrowing and filled with ice, the torque I so desperately needed to make the large move up to the choss above just wouldn’t stick, ripping every time any real weight was applied to it. 10 minutes of failed attempts passed and placing a wobbly hex to protect the belay, I found the confidence to match a small blown pocket further right with the very tip of my picks. Stepping high on my front points I reached for the turf, still coming short. My right foot came higher almost level with my handles, to a matchstick edge and I exploded to full extension. Out of view my pick bites as it catches a small chockstone frozen in place and my feet scrape the walls, using my monopoints on any minuscule ripple in the rock to push me up and under the far right of the roof. With less difficulty than the lower section I climbed left and up and under the centre of the roof into a world of large icicles and overhanging white ceilings. Their only weakness the thin cracks that shot out horizontally away from me, lined with gloss-like ice. I composed myself away from the spectical of where I was and focused on the priority at hand, finding gear to protect the likely event of a fall from the inevitable battle on the roof. I found a good sideways ‘tin opener’ placement for my axe, allowing me to lean away from the vertical wall and reach out under the roof to place gear. Several core-tensing minutes later and a lot of chipping away at the ice within a crack I’d managed to find a bomber tri-cam (my favourite and personally the most valuable piece of winter gear available) and a small nut to back it up in the roof. With this protection in, my courage grew and with the lactic acid beginning to build in my arms and the strength being used by one arm starting to outweigh the recovery of the resting one, I knew I’d have to start the siege on the roof soon. 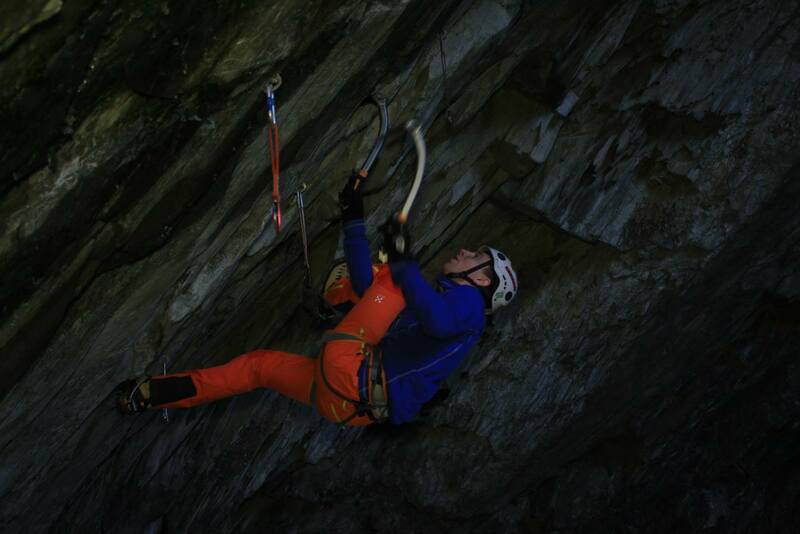 I leant back on my axe and dropped into a press out right allowing me to be able to reach into a thin crack that I’d eyed-up from below the roof. I slotted in my pick to find it slide straight through. Rising the axe again, this time really twisting in on my handle to torque the pick as much as possible. The movement stopped and I weighted it, swinging my legs out over the void below me and digging my front points into the turfy crack to my right to counter the involuntary swing from my feet leaving my safe haven under the roof. I tried to move quickly to find the next hook. I pulled high on my axe, searching ferociously to find a good placement and finding nothing but a small sloping edge that only stuck at the very lip. I decided it would have to do as I was fighting a loosing battle against the rising pump in my forearms. 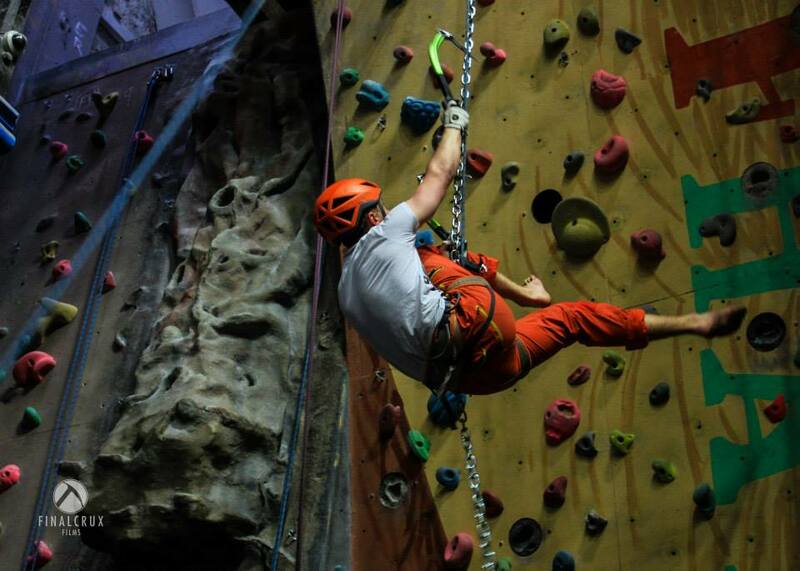 Matching the non-existent hold, I moved my feet further right, trying to position myself for the next move. 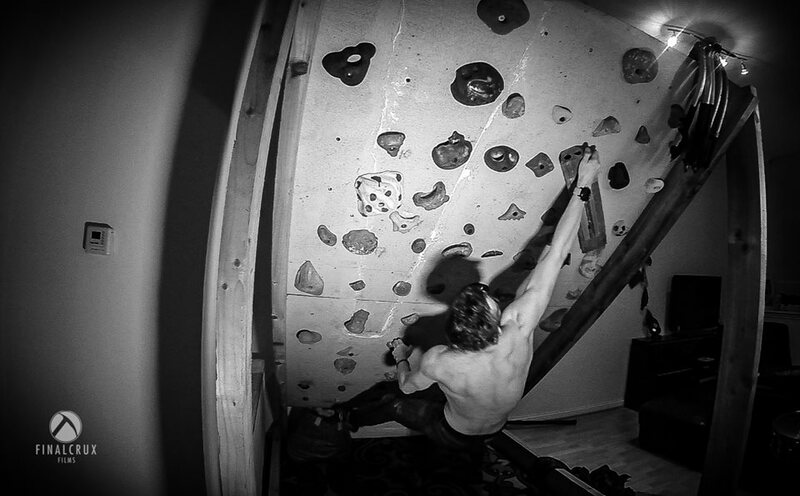 My grip was becoming weak, I didn’t have the energy to shake out and as I went to make the next placement, that was it. Energy reserves gone. Arms emptied of strength. I was off. The roof falls away from me as I tumble through the air. Natural instinct trying to keep me as upright as possible, I feel the rope come tight to my harness. Brace for impact. Bang! I’d hit the wall but swung back out into clear space dissipating most of the fall onto the rope thanks to Euan’s dynamic belay. I righted myself and let out a big WOOHOO!! My onsight attempt had failed but I had taken the burn as a great success. I’d managed three-quarters of the route on my on-sight, I hadn’t bottled it and bailed off when I got scared and I’d proved to myself that it was within my capability. I was over the moon! Me getting boxed searching for hooks on the roof. We spent the rest of the day refuelling with lunch and giving it several other attemps, each one slowly increasing my highpoint throughout the day but the route wasn’t going to give in that easily. I had given it my all today but it just wasn’t quite enough. After my fourth attempt we called it a day and I retrieved the gear and we packed up to head back down the hill. 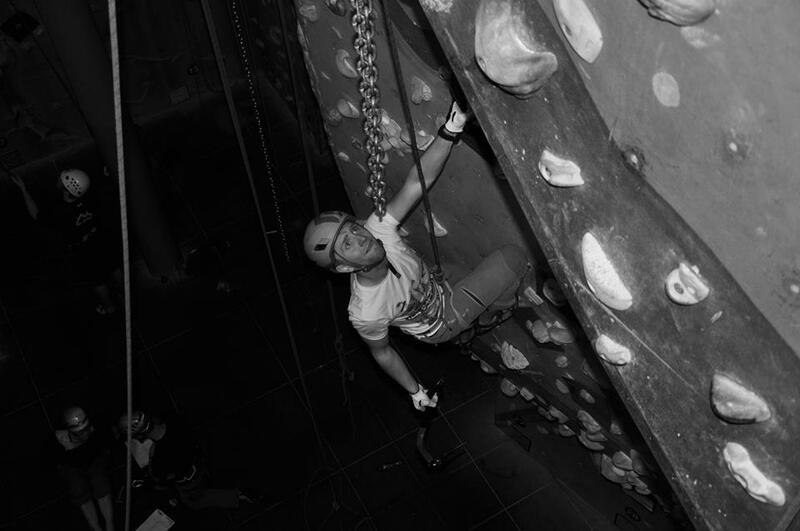 Although disappointed to leave without the ‘tick’ when I’d been so close, I’ve come away from the experience feeling really motivated to push my limit on other hard routes this season and I’m super psyched to up my training and return to claim victory on ‘The Cathedral’ one day soon. A BIG thank you to Euan for coming up the hill with me and bearing the cold just to belay. Also thanks for your motivation. Without it I probably would have bailed well before pushing myself to my full potential. 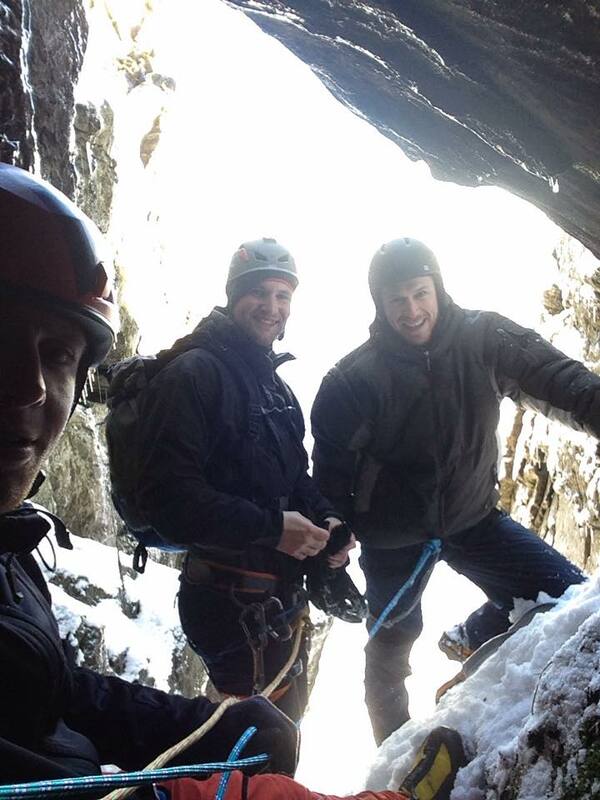 A little taste of winter climbing. Posted on December 27, 2014 by I Never sign out at work. With the Christmas in full swing my two brother in-laws, Sam and Steve had both come up to Scotland with my sisters for spend the festive season at my parents house. With promise of the good weather holding out for the remainder of their stay I’d promised to take them both up the mountains for a little taste of the Scottish winter climbing. Due to unexpected circumstances the guys would have to be leaving a day earlier than previously planned so we decided to change our plans from travelling to Glencoe to the Arochar Alps to save the time spent on the long walk-ins and travel. With the weather looking so amazing I knew that almost any crag would be in good condition, especially for the grade 1/2 gullies that I was wanting to take them up. We resorted to ‘The Cobbler’, it being so close from my parents house and an easy walk-in for the guys that had next to no hill fitness it was the obvious choice. We started early to avoid the expected crowd of people flocking to the mountains due to the holidays and the amazing weather, it also gave the guys a chance to take their time on the walk-in. Lots of huffing and puffing later and with some encourage meant to just keep moving from me, we found our self’s kitting up under the start of ‘Great Gully’. This having been one of my first winter routes years ago I thought it would be the perfect starting route that wouldn’t be too technically difficult but would provide a real insight to what winter climbing (rather than winter walking) was all about. I started leading up the route talking the guys through using their crampons and axes efficiently, reaching the top of the first with and set up a solid belay to bring both of them up the pitch. It’s always great taking people with little experience of the Scottish highlands and showing how spectacular it really can be. An easy feat with weather like we had today. Bringing them up the first pitch one by one their eyes lit up as they crawled under the huge chock stone at the beginning and climbed up into the main gully. 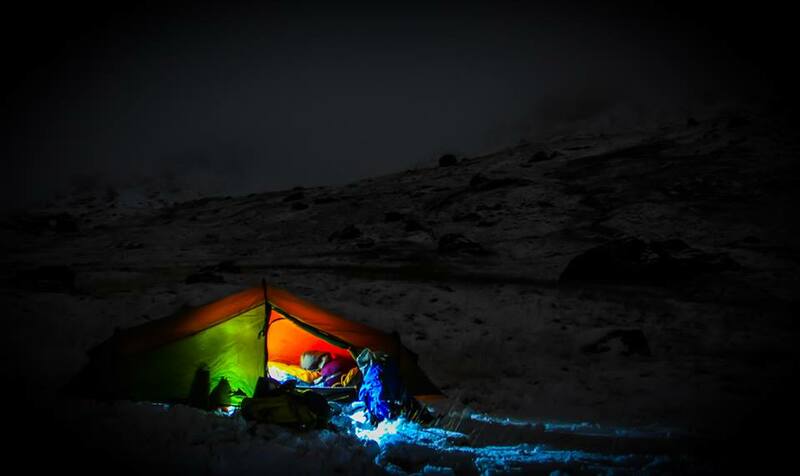 I watched as they stood, dumbstruck at the sight of the ice and snow-covered walls of the north peak towering over them. We all gathered to the right of the gully where i had cut out a small ledge to stand on and switched over the ropes so i could continue on leading up the route. I climbed over what is usually the ice bulge on the second pitch I realised that it wasn’t any where near as banked up as it usually is making stepping over it slightly difficult and I hoped the guys would be able to cope with it as they came up on the second. As they topped put onto the ridge I congratulated the two of them for tackling crux without too much of a struggle (only the odd cry for help from Sam trying to remove a stuck piece of gear!) As we broke over the crest of the summit, Both of their faces lit up with surprise at the magnificent view of the surrounding hills. With the exceptional visibility we could see over the Bridge of Orchy hills all the way up to Glencoe with the sun radiating down onto the snow topped peaks creating a sight that silenced us all in awe.